With revenue growth business models, facility managers need a solution that allows them to improve safety without impacting productivity or profitability. The evolution of automated window cleaning systems offers a solution that meets both of these demands. This white paper will describe the challenges associated with manual cleaning methods, as well as highlighting the performance, safety and cost benefits associated with automated systems. In today’s marketplace, businesses are seeking any advantage to gain a competitive edge. One way to improve public perception and company reputation is to maintain a clean facility from the inside out. While cleaning the inside of a building presents its own challenges, maintaining the exterior can be a dangerous – or even deadly – endeavour. 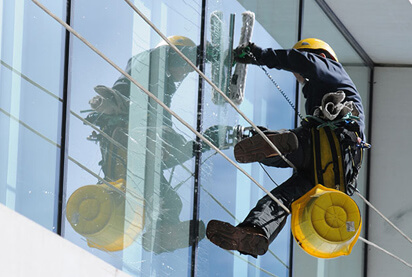 Traditional window washing methods, such as boatswain’s chairs or scaffolds, require workers to hang precariously over the side of multiple storey buildings and leave them vulnerable to falls and other injuries. According to the Occupational Safety and Health Administration (OSHA), work-related hazards are a serious concern, resulting in over 700 deaths in 2010 in the USA alone. Additionally, fall injuries constitute a considerable financial burden for companies. Workers’ compensation and medical costs are rising from occupational fall incidents, and, according to the Centre for Disease Control and Prevention, are estimated at approximately $70 billion annually in the United Sates. These costly injuries directly impact a company’s potential for profitability. The Occupational Safety and Health Administration (OSHA) was established to ensure safe working conditions by creating and enforcing workplace safety standards and providing training, outreach, education and assistance. One of the administration’s many areas of expertise is fall protection. Work-related falls are one of the most common causes of serious injuries and deaths. For occupations that require workers to perform tasks at high altitudes, OSHA requires employers to provide working conditions that prevent employees from falling off overhead platforms and elevated workstations. Each employee should be protected from falling 6 feet (1.8 meters) or more by guardrail systems or personal fall arrest systems, such as harnesses, safety nets or handrails. Additionally, employers must also select and provide protective equipment at no cost to workers. The American National Standards Institute (ANSI) oversees the creation, promulgation and use of thousands of guidelines that impact businesses in nearly every sector. The International Window Cleaning Association (IWCA) was formed by a group of window cleaners in an effort to promote safety and education, as well as enhance professionalism throughout the industry. The ANSI/IWCA I-14 standard is designed to serve as a guide in the formation of safety rules and regulations for the industry. It is to be used as a reference by registered professional engineers and architects, as well as by manufacturers of window cleaning equipment and devices. This standard applies to all window cleaning operations performed on the inside or outside of any building in which the window cleaner is working from a level that is located more than 48 inches (1200 mm) above ground, or above an adjoining flat roof or other flat surface. Employers must provide safety equipment and devices and maintain this equipment in safe operating conditions at all times. High-rise and skyscraper window washers are required to put themselves in dangerous situations, dangling over the sides of buildings via ropes, and using abseiling techniques to control their rate of descent. Some work alone, using a boatswain’s chair, while others work in teams on scaffolding. Both present similar challenges and safety concerns. The boatswain’s chair is a device that consists of a small seat that is suspended from a rope that attaches to the roof of a building. By using a seat instead of a climbing harness, workers experience limited range of motion during cleaning, but some boatswain’s chairs also feature a separate harness to protect against falls. Companies also implement movable scaffolding for exterior cleaning applications. Movable scaffolding is similar to stationary scaffolding, but uses a harness system to raise and lower the structure along the side of skyscraper buildings. Since scaffolding holds more than one employee at a time, workers are able to work in groups to complete cleaning jobs. Both of the aforementioned cleaning solutions require workers to be suspended over the side of a building. Therefore, exercising extreme caution and attention to detail is crucial for a seamless and safe operation – a single mistake could have potentially deadly consequences. The inherent danger associated with these cleaning solutions mandates that employees be highly trained in order to operate these devices, which can lead to additional expenses and a paucity of skilled employees being available. Manual window washers are challenged with the fact that each building is different, so they must decide the best course of action for each individual descent. Traditional window washing is a slow, steady process that necessitates precision when adjusting the boatswain’s chair or scaffolding. These adjustments must be made each time workers are ready to move on to the next section, creating additional downtime that reduces productivity. Further, given that their equipment serves as their lifeline, regular inspections and maintenance must be performed in order to ensure that any/all equipment meets regulation standards, with any repairs or replacement resulting in costly downtime and additional expenses. When working from extreme heights, injuries are not uncommon, and each incident can result in significant costs for a company from both a workers’ compensation and a labour standpoint. For instance, according to OSHA’s Safety Pays estimator, one work-related fracture can cost a company as much as $93,300 to cover the direct and indirect costs of the injury. This includes hospital bills, paid time off, administrative costs, replacement labour, and more. As these costs add up, injuries can dramatically diminish the company’s profit margin. To meet the demand for a safe and effective cleaning solution, automated window cleaning systems have been developed to replace boatswain’s chairs and scaffolds. These units eliminate the need for employees to dangle over the edge of a building. 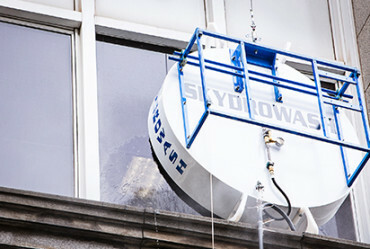 Instead, operators can safely control all window-washing activities from the ground or rooftop. Automated systems offer diverse capabilities and are designed to increase cleaning quality and productivity by allowing workers to complete high-rise cleaning applications faster. Some systems can clean as much as 150m² in 15 minutes. Additionally, automated systems are engineered to effectively clean flat buildings without window offsets, as well overcoming the cleaning challenges presented by deep or irregular window offsets, curves, recesses, overhangs, protrusions, inset glass, asymmetrical frames, or other obtrusive architectural features. A remote controlled unit that has an integral motor. For consistent cleaning results, some systems also feature a counter-balance design that uses dual hyper fans to ensure that the system attaches to the building contour, even when gusts and high winds are present. Further, to satisfy growing “green cleaning” standards, automated devices can utilize filtered, ultra-pure water, eliminating spots without the use of harsh chemicals. While traditional window cleaning methods are viable options that are still commonly used in today’s cleaning applications, the benefits experienced with an automated system allow users to simultaneously improve safety initiatives, reduce costs, and maximize cleaning results. By remaining firmly planted on the ground or rooftop, operators are not subject to the same safety risks that workers who are suspended in boatswain’s chairs and scaffolds must endure. Workers maintain control over device operation in order to produce the necessary cleaning results, but are no longer required to put themselves in perilous situations that could result in falling multiple stories and sustaining severe or fatal injuries. By removing workers from harm’s way, companies can easily meet any strict OSHA and other safety guidelines without providing additional safety equipment. In many cleaning applications, the highest cost percentages arise from labour expenses. Manual cleaning operations are time-consuming and labour-intensive, ultimately translating into higher labour costs. Replacing these methods with an automated system can result in as much as 60 percent in labour savings. Implementing automated window cleaning systems can also cut equipment costs, as companies can avoid purchasing safety equipment, such as guardrails and harnesses, as well as squeegees, buckets and other cleaning supplies. Plus, some automated systems offer water-only cleaning, which also eliminates the additional cost of detergents. Improving safety has a direct impact on a company’s bottom line, not only by reducing the actual payout for work-related injuries, but also from an insurance standpoint. By reducing the risk of window cleaning operations, companies can decrease the cost of required insurance coverage. Typically, there is a direct correlation between high insurance rates and risky or potentially dangerous work. Therefore, by utilizing technology that eliminates the risk to employees, companies may be eligible to lower their premiums for the mandated liability insurance. Facility cleanliness impacts a customer or occupant’s impression of management or of the company as a whole. Therefore, keeping a clean facility can improve client retention and improve worker satisfaction. 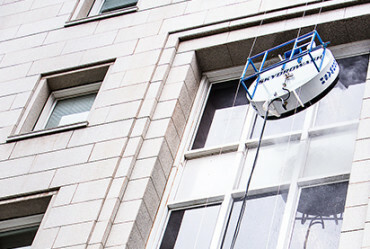 Automated window cleaning systems are designed to clean not only the windows and glass, but also to scrub the entire exterior of a building for a comprehensive clean. Some machines even offer an optional in-line water heater to deliver hot water for removing stubborn stains. Plus, with a custom-engineered and automated device performing cleaning applications, users can benefit from a uniform cleaning result, something that is difficult, if not impossible, to achieve with manual labour. While no two cleaning applications are the same, most facility managers have similar goals: high-quality results that are achieved safely without impacting productivity. Automated window cleaning systems satisfy these demands without the time-consuming, laborious operation or safety hazards operation associated with traditional cleaning methods. Automated window cleaning expedites cleaning completion, with less labour and a consistent result. If one compares the rope access system to the Skydrowasher, the machine is ten times faster over any given area. An adept rope-access cleaner can clean 150m² per working day. Generally speaking, rope-access workers clean between 100m² and 120m² per day. 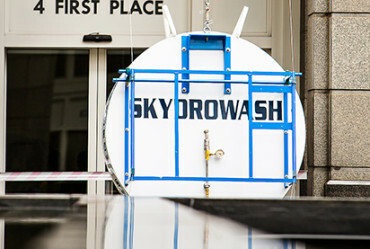 The Skydrowasher cleans 10 – 12m² per minute. Therefore, mathematically speaking, it can clean 150m² in 15 minutes. The machine operator can elect to do additional cleaning runs if necessary, depending on how dirty the windows are. Buildings that are cleaned regularly (i.e. four times per year) generally require one or two runs. Additionally, the machine also cleans the hard outside surface of the building, if required. It’s worth noting that the rope-access method requires cleaners to work with a bucket of clean water which soon becomes soiled, depending on how dirty the building is. The water must be changed as soon as this happens. This takes time. Not refreshing the water at regular intervals will negatively affect the outcome. 68 kg of weight for transport/ballast cart.